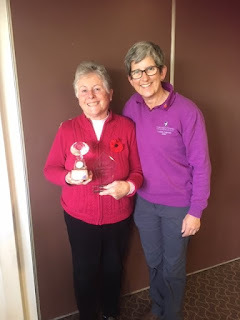 Rogie Taylor - won the Mary Warmoth Cup - with Kathy M - Rogie received a picture of the cup from Kathy! We will get a pic of both of them with the Cup in due course! I still have a few prizes to give out to those unable to attend the AGM but they will be awarded....preferably not in the car park!!! 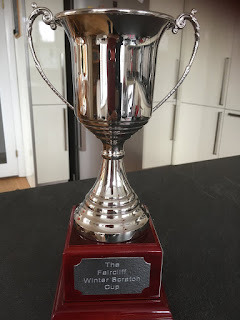 More about Cups now...here is the new Faircliff Winter Scratch Cup! The draws for the above trophy KO and the Winter Handicap KO are now on the board with the rules of engagement alongside. The Pearson Season started last week with a match at home against the Manor of Groves. 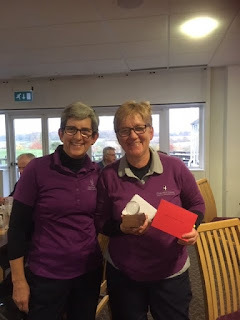 Megan had selected and prepared her squad in a very professional manner and although she could do nothing about the weather (which was horrendous!) the team performed brilliantly and kicked off the season with a 5-2 win. A very big pat on the back for all...next up is an away match at Essendon on 23rd November. 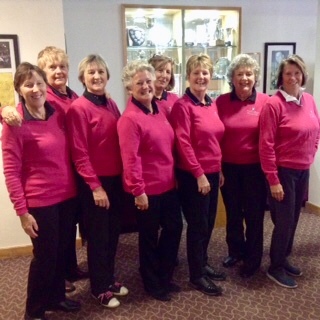 Finally this week and by no means least, the rearranged Captain's Day and evening was great fun. I hope you enjoyed it as much as I did and thank you to everyone who made it another special Chesfield night and a memorable one for me.